With nearly 150 participating anglers, the 13th annual Philly Fun Fishing Fest at Schuylkill Banks continued to grow this year, logging the highest number of registrations ever. In all, 131 fish spanning nine species were reported to the judges. See all the winners and prizes here! Thanks to our partners at Philadelphia Parks and Recreation, the Pa. Fish and Boat Commission, the Schuylkill River Development Corp. and our prize sponsors: Dicks Sporting Goods, Flambeau Outdoors and Philly’s own Bob’s Bait and Tackle. The bait shop, located just up-river in East Falls, kindly provided the grand prize for the raffle. The Laffertys at their long-time fishing spot along the Schuylkill River in Center City Philadelphia. “That bag, that tackle box, the stuff in it…even this rod, it’s all stuff we’ve won by doing pretty good here,” Jamie Jr. said with laugh, his father pulling in (yet another) catfish. Jamie Sr. would later win “Most Successful Angler” in the senior category, adding a fine new rod to the growing Lafferty arsenal. Indeed, if there were a prize for perfect attendance, they’d win that too: the Laffertys have not missed a single year since the fest's 2004 debut. Each September, sure as shad returning in spring, the father and son duo can be found at the same spot on the Schuylkill’s shoreline, using a type of catfish bait which they’d rather not disclose, but is sold fresh each morning at Kaplan’s Bakery at 3rd and Poplar in Northern Liberties. Held on September 9 by the Philadelphia Water Department, the Pa. 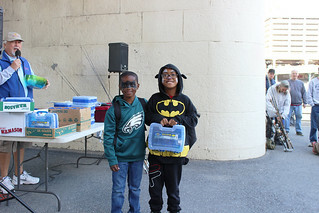 Fish and Boat Commission, Philadelphia Parks and Recreation, and the Schuylkill River Development Corp. to showcase the health of Philadelphia’s urban rivers, the free fishing fest drew nearly 150 participating anglers in its 13th year and logged the highest number of registrations ever. In all, 131 fish spanning nine species were reported to judges. The top three largest fish caught were all channel catfish, coming in at 23 inches, 21 inches and 20 inches. The biggest catch that wasn’t a catfish was landed by 4-year-old Ava Morales with her impressive 19.5-inch American eel. “Smallest Fish” went to a 3-inch shad. White perch, sunfish and channel catfish were the most common species. Anglers were allowed first casts at 7 a.m., and prizes provided by Dicks Sporting Goods, Flambeau Outdoors and Philly’s own Bob’s Bait and Tackle were awarded just after 11 a.m. The local bait shop, located just up-river in East Falls, kindly provided the grand prize for the raffle. Casting lines in the shadow of their favorite bridge, the Laffertys recalled stories collected over the years: the guy who emerged from the bushes in a studded leather jacket and asked for the local punk bars; the woman who’d sat beside them one year and built a sort of hippie camp, complete with burning incense; and, perhaps best of all, the mysterious, seemingly ownerless dog that nonchalantly passed them as it swam happily upstream with the incoming tide, passing under their lines and paddling toward the Fairmount Water Works and out of sight. Soaking in the long row of fellow anglers stretching along the water at Schuylkill Banks, Jamie Jr. noted that the area, besides perhaps tougher parking, has really improved over the last 13 years. The Schuylkill River Trail, bustling with bikers, joggers and walkers on this Saturday morning, has improved and expanded. The Schuylkill Banks Boardwalk added new amenities to the area a few years back. Even gleaming, new buildings had arisen nearby in the years since they’d begun fishing there for the festival. 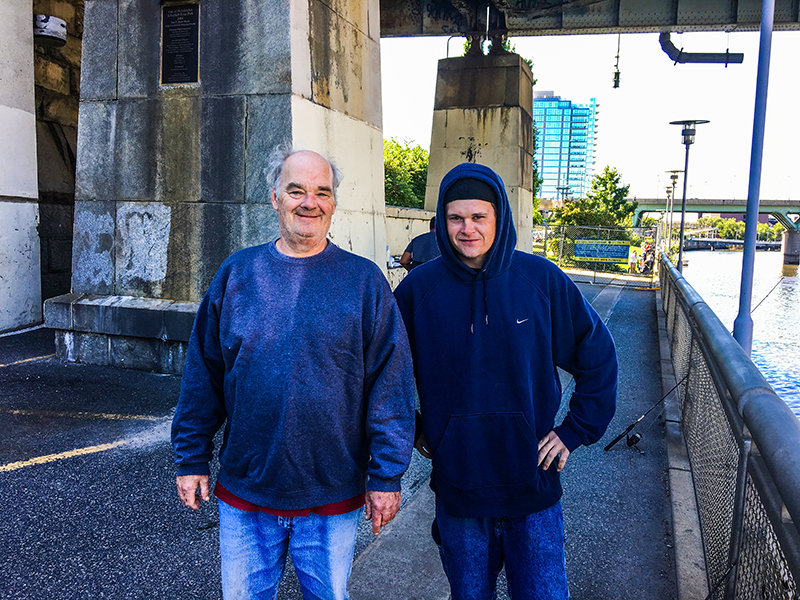 “A lot of this area along the river, I think it was just sort of bushes—definitely not as nice as it is now,” said Jamie Jr.
And, while the fishing tends to vary from year-to-year depending on weather and other factors, they both agreed that the Schuylkill seems to be getting cleaner and cleaner. And with that, right on cue, his dad landed another wriggling catfish and headed off toward the judges' table.